Note: Our cottage cheese is very thick and doesn't have a lot of watery juice, but if yours tends to be on the wet side, you might find it helpful to strain before dehydrating and/or opt to start the process of drying the curd on a fruit leather tray or with parchment paper instead of the open racks. I was pleasantly surprised to have zero issues with using the racks since rack drying is faster and flip-free. See tips and tricks below for more on choosing a cheese. Drain or strain cottage cheese if/as required (see note above) to remove excess liquid. 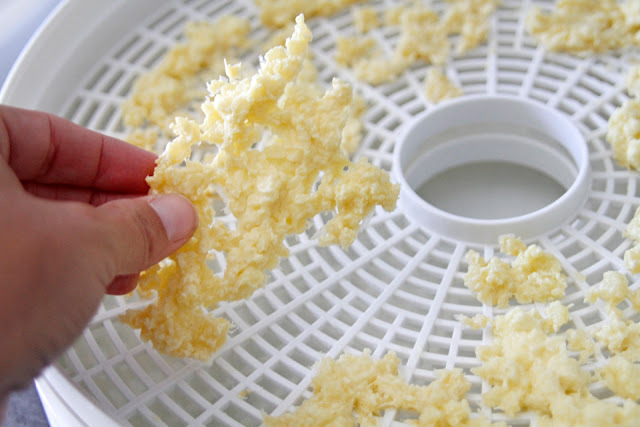 Place cottage cheese in thin dollops on a dehydrator rack (or prepared tray). Dehydrate according to your specific dehydrator's settings/instructions. The mid-range temperature settings (typically ~55C) are sufficient for cottage cheese. It's better to dehydrate low and slow than try to rush things along with higher heat, as this helps ensure it dries evenly all the way through. If you don't have a dehydrator, you can substitute an oven-safe baking/cooking rack, drip tray, and a fan-forced oven. Cottage cheese is safe for raw eating (by people and pets), so unlike meats that need to reach higher temperatures for jerky safety, it isn't necessary to use high temperatures with cottage cheese. If you wish, you can still use a finishing hit of higher heat to safety "cook" the curd after it's been dried. The dehydration time will depend on your machine, how thick your curds are spread, and the moisture content. As the cottage cheese dries, it will change in colour and take on a firm crispy texture. When fully dry, it will be solid and snapppy/crunchy. As noted in our jerky posts, lower fat foods dehydrate faster/better and generally store better. Reduced fat cottage cheese will dehydrate quicker than standard cottage cheese, although I've tried both trim (<1%) and standard (~5% by weight, by the label) successfully. Allow to cool thoroughly before storage. The dried curd is brittle and can be broken into crunchy little nuggets for treats or even whizzed into a fine crumb for a sprinkle topper. I prefer chunks. Simple and flexible as a treat or a topper. Sealed cold storage is recommended. In theory, thoroughly dehydrated cottage cheese should be shelf stable if kept completely dry; however, I prefer to err on the side of food safety caution and keep mine in the fridge (or freeze if making a large batch for extended storage). Cottage cheese is absolutely delish on it's own and our dogs went wild for it. There is no need to jazz it up with extra scents or flavours...unless you feel like playing, of course! Imagination is the limit! Cottage cheese has the advantage of being able to work with sweet or savory, although I tend to lean towards the side of savory. If you would like to flavour you cottage cheese, strain/drain the cottage cheese in preparation (if needed) and then mix in your add-ins. Remember, add-ins can affect the dehydration process and/or the texture/consistency of your cottage cheese (when wet and/or dried). Once mixed, the basic process is the same as shared above. The easiest add-ins are powders or small dried ingredients as they are least likely to affect consistency and outcome. 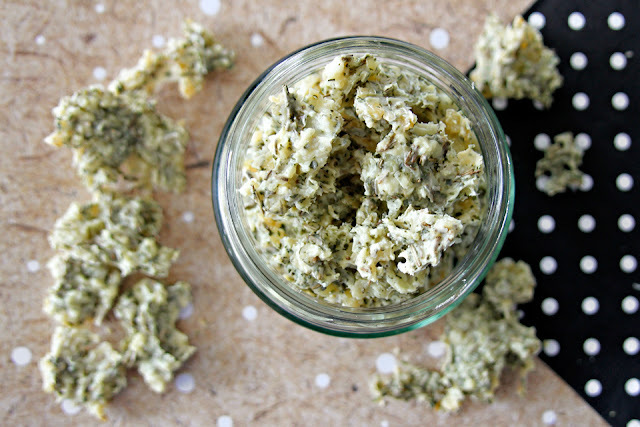 To keep things simple, crunch, and delicious, dried dog-friendly herbs work particularly well. Rosemary is one of our dogs' favourite herb scents (drool drool) and our experiments with rosemary and parsley cottage cheese came out fabulously! Using add-ins that are moist and chunky may complicate getting a consistent dehydrated result. If you'd like to use something like that, for example fruits, veggies, etc), you can puree the add-ins and mix thoroughly for a more homogeneous blend. You may need to use parchment or tray to compensate for the additional liquid. Adding liquids will alter the consistency and you may need to use parchment or a tray. Our dogs don't have any issues with lactose, but dairy isn't for everyone or every pup. Aged cheeses have the lowest levels of lactose. Fresh unripened cheeses, like cottage cheese, are higher but generally still in the low-lactose range. S8ince lactose is milks natural form or sugar, for "plain" dairy products, check the sugar content to gauge the lactose levels. For example, our usual cottage cheese is ~2% by weight by label (2g/100g). Lactose-free products are available (double check all ingredients for safety) or you can make a homemade cottage cheese; however, these are often a different consistency than traditional cottage cheese so you may need to strain, drain, or adjust the basic dehydrating process above to suit. Cottage cheese can be very high in added salt, which isn't good for dogs (or people). As with any food/treat/ingredient, always check the labels. Look for lower/low-sodium or no-salt added options where available. Cottage cheese is generally very low in fat compared to other cheeses; however, different levels of fat content are available. Reduced fat cottage cheese will dehydrate quicker than standard cottage cheese and with a slightly different consistency, but I've tried both successfully. Sealed cold storage is recommended. In theory, thoroughly dehydrated cottage cheese should be shelf stable if kept completely dry; however, I prefer to err on the side of food safety caution and keep mine in the fridge (or freeze if making a large batch for extended storage). For different reasons, may of our furfriends are on restriction diets, especially some of our Dal pals. Dalmatians differ from other dogs in how their bodies metabolise purines, which places them at a heightened risk of kidney and urinary crystals and stone formation. Yeouch! High purine-yielding foods are the same foods that aggravate human gout. While our dogs aren't (or shouldn't...) be chowing down on rich desserts or alcohol, a lot of the food sources that would be fantastic for most dogs (wild game, red meat, organ meats, etc.) are high purine. This makes it extremely difficult to buy quality commercial dog foods and treats, which is one of the factors in why we started experimenting with making our own. On the flip side, it also makes it extremely difficult to feed a balanced raw diet - especially with a whole-prey mindset. I've studied the principals (including recently completing a Raw Dog Food Nutrition Specialist certification), but purely for the broader knowledge. Dalmatians don't neatly fit a typical dog nutritional model, and their diets should be planned on a case-by-case basis in discussion with your trusted vets. We're fortunate that none of our dogs have, thus far, had issues, but it's better to lean on the side of safety and so we aim to moderate their purine intake. Our dogs get a variety of meats and fish in moderated quantities, but also a lot of less traditional dog foods, including dairy, eggs, gelatin, fruits, veggies, nuts/seeds, and more. Gelatin is one of our favourite treats and bridges all sorts of doggy dietary models, including being a low-purine protein (one more of the many reasons we love gummies!). 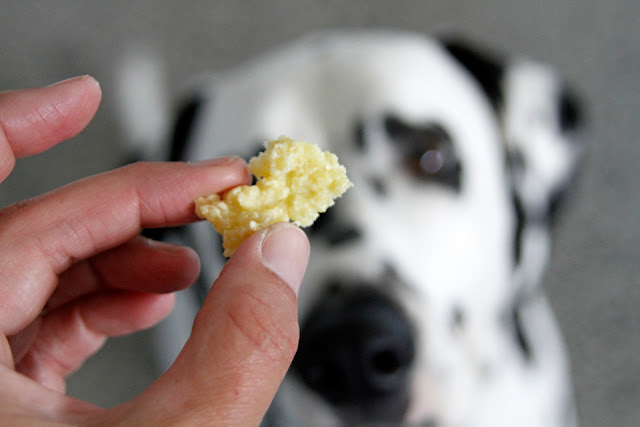 Eggs and cottage cheese are also doggone delicious nutritious lower purine protein sources. Want to dive deeper? We have an active board on Pinterest dedicated to urate and purine related content.